Heat Transfer Fluid Market to accumulate substantial proceeds from CSP applications, product differentiation to characterize the competitive landscape « Global Market Insights, Inc.
Heat Transfer Fluid Market has been gaining an edge successfully in terms of revenue streams and profitability quotient, given the increasing penetration of concentrated solar power in the renewable energy matrix. In fact, it would not be overstated to assert that the key to success of any CSP plant majorly grounds on the quality of heat transfer fluids that are being utilized in running the plant, pertaining to the fact these fluids transfer heat from one component to another and finally to the power block, where the heat energy is converted into electricity. Global concentrated solar power installed capacity has witnessed a growth of 1.56% over 2015-2016, reaching almost 5017 MW by the end of 2016, claims CSPPLAZA research center, China. Not to mention, the aforementioned statistic has left a perpetual influence on the demand curve of heat transfer fluid market, with CSP having chronicled the title of the most lucrative revenue ground for the overall business fraternity. As per estimates, heat transfer fluid industry from CSP application is slated to record a CAGR of 7% over 2017-2024. One of the pivotal factors responsible for the massive growth of heat transfer fluid industry is its widespread end-use spectrum. Practically almost in every industrial process ranging from food & beverage and plastics to pharmaceuticals and oil & gas sectors, the requirement of highly efficient heat transfer is quite profound. While heat transfer efficiency can be improved by several methods including incorporation of vibration in heat transfer surfaces, deployment of microchannels, and utilization of extended surfaces, increasing the thermal conductivity of working fluid is claimed to be the most pronounced approach that wins a mass popularity. In response to the material’s extensive utilization in majority of the industrial sectors, companies involved in heat transfer fluid market have been heavily investing in R&D activities to come up with innovative cutting-edge solutions. Taking into account the pace of innovation that is expected to continue with technological proliferation, heat transfer fluid industry is forecast to experience a renewed dynamism with regards to product differentiation, business models, and manufacturing processes. Say for instance, advancements in nanotechnology has led to emergence of a new class of engineered fluids, that are mainly produced by the amalgamation of nanomaterials in conventional heat transfer fluids. The so dubbed nanofluid, took heat transfer fluid industry space by storm when its unrivaled combination of unique benefits came to light. The nanoparticles that are uniformly distributed in the base fluid are claimed to improve the thermal conductivity by increasing the convection and conduction coefficients, thereby ensuring a more efficient heat transfer. Much efforts have been already taken to exploit the potential opportunities of nanoparticle – enhanced thermal fluids with regards to heat transfer. Recently, a research team led by Siberian Federal University in collaboration with Spanish scholars have proclaimed that TiO2 (titanium oxide) nanofluids could outpace other analogous materials in heat transfer applications that are presently in solar power stations. Amidst the backdrop of a scenario where renowned giants have been striving to bring innovative products in the foreground, titanium oxide nanofluid would certainly prove to be remunerative for the overall heat transfer fluid market. Worldwide, heat transfer fluid industry is quite consolidated with renowned biggies procuring almost three fourths of the global share. Statistics depict that the presence of Dow Chemicals is rather dominant, covering almost 28% of the marketplace in 2016. While industry giants seek immense growth in the years ahead, a wide array of daunting challenges might hinder the business proliferation to some extent. Volatile crude oil price trends and stringent government regulations with regards to the toxicity of product are two major constraints that heat transfer fluid market players are presently dealing with. Despite these challenges, market investors are making big bets in research activities in a more progressive approach, vividly coherent from the agreements, mergers & acquisitions, product launches that are quite common in heat transfer fluid market ground. 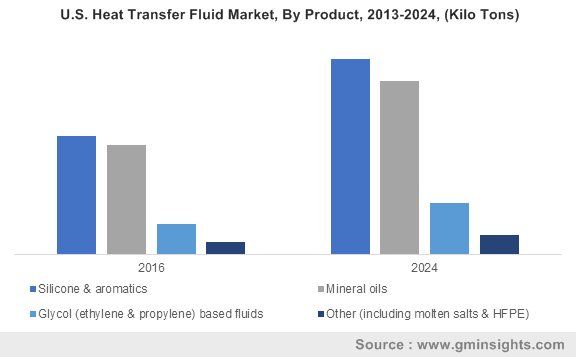 In terms of profitability, Global Market Insights, Inc. forecasts overall heat transfer fluid industry to exceed a valuation of USD 4 billion by 2024. This entry was posted in Bulk & Specialty Chemicals and tagged APAC Heat Transfer Fluid Market, Europe Heat Transfer Fluid Market, Heat Transfer Fluid Market, Heat Transfer Fluid Market Analysis, Heat Transfer Fluid Market Forecast, Heat Transfer Fluid Market Growth, Heat Transfer Fluid Market Outlook, Heat Transfer Fluid Market PDF, Heat Transfer Fluid Market Report, Heat Transfer Fluid Market Share, Heat Transfer Fluid Market Size, Heat Transfer Fluid Market Trends, U.S. Heat Transfer Fluid Market.